QUANTITIES ARE LIMITED - WHILE SUPPLIES LAST - These wonderful metal cabinet knobs are beautiful and these metal knobs are perfect for kitchen cabinet doors, furniture drawers, bathroom vanities, dressers, and restoration of vintage furniture. 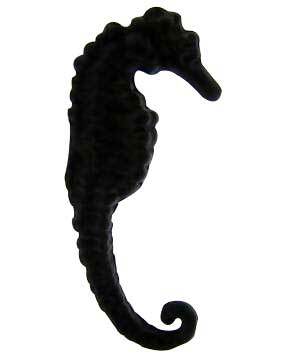 This knob is made in the shape of a seahorse and the finish is matte black. Both beautiful and durable, these imported metal cabinet knobs are individually hand made by professional metal smiths. These metal cabinet door knobs measure 3 inches in length (76 mm) and have a projection of 7/8 inches (22 mm). These metal cabinet knobs are sold individually and they come complete with the hardware, too. The bolts for the metal seahorse metal cabinet door knobs measure approximately 1 inch (25 mm) long.